Opinions are divided over the new pictogram for hot springs. With only four short years to go before the 2020 Tokyo Olympics, Japan is gearing up to welcome visitors from across the world with revamped stations, larger taxis, and even artificial meteor showers. One of the most recent developments, however, is dividing people in Japan, with the announcement that one of the nation’s most well-known and often used pictograms, the Japanese hot spring (“onsen” in Japanese) symbol, is up for revision. ▼ The “onsen mark” features a circular line, which represents a hot spring bath, along with three curved vertical lines resembling steam. According to the The Ministry of Economy, Trade and Industry (METI), the symbol could be misinterpreted by foreigners as the mark of a restaurant that serves hot food. 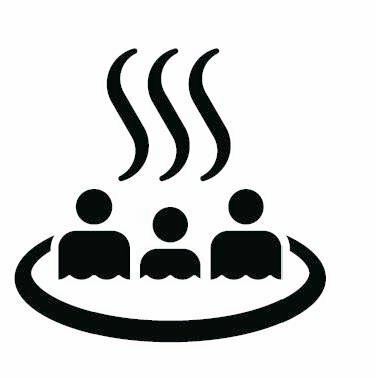 To avoid confusion, three people have been added to the onsen symbol, to clarify the fact that the image is used to represent hot spring bathing. The revamped image, which was revealed by METI at a Japanese Industrial Standards revision committee meeting last week, is one of 70 public symbols set to appear from next summer in order to meet standards set by the International Organization for Standardization. Other pictograms up for revision include the “do not touch” symbol, which looks at changing the current raised palm image to a hand touching a flat surface with a diagonal line crossing over it, and the “information office” sign, which will be changed from a question mark to the more universally used “i” symbol. In addition, the ministry plans to create 40 new symbols for foreign tourists, to indicate Wi-Fi hotspots, ATMs that accept overseas cash cards, and prayer rooms for Muslims. It’s the change to the onsen mark, however, that has some residents concerned, with much larger ramifications for onsen resort towns and businesses that incorporate the current symbol in their logos and products. The pictogram, for example, is used as part of the city logo for Atami, a famous hot spring town in Shizuoka Prefecture. Atami uses the logo on its flag and city seal, with many products, souvenirs and even manhole covers in the area bearing the mark. Like Atami, other onsen towns that use the mark are now faced with the dilemma of deciding whether to use the revised symbol on their products for foreign visitors or stick to the original design. ▼ Onsen manju, soft sweet buns cooked by the steam of hot springs, are commonly stamped with the symbol, and they even have a cute character, Onsen Manju-kun, modelled after them. It’s yet to be revealed if the revision to the pictogram will affect them in the future. While final revisions to the 70 symbols will be made by the end of the fiscal year in March 2017, the pictograms approved by JIS will not affect maps, but will be widely used in public spaces like buildings, train stations and tourist areas.